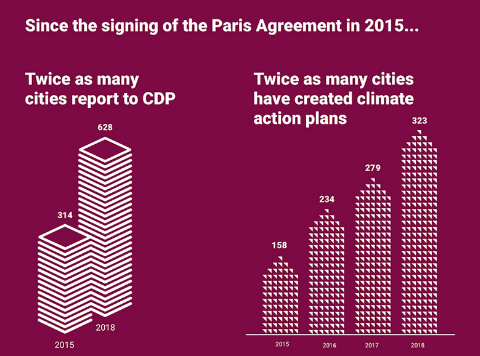 Global cities stepping up on climate action The shift to a low-carbon economy is underway and cities worldwide are stepping up to tackle dangerous climate change. With increasing extreme weather events worldwide, cities are aware of the climate risks they face and are taking vital actions to reduce emissions. In light of the recent IPCC report, we know that urgent action is needed to limit warming to 1.5°C. Cities are taking action to combat climate change today and are planning for the future through ambitious target setting and forward action planning. To find out how cities are leading the change, explore our infographic by clicking here.